Why are video games better at recognising the dangers of climate change than politicians? Last year, The United Nations published a report by the Intergovernmental Panel on Climate Change, and it painted a dire picture of the earth’s future. If world leaders don’t make drastic reductions to their nation’s carbon emissions, said the report backed by almost 100 reputed scientists, we will be facing an international catastrophe of untold proportions from as early as 2040, marked by rising temperatures, frequent natural disasters, an accentuated refugee crisis, food and water shortages, and the collapse of the global ecology as we know it. It's no wonder, then, that so many people are spending more and more time playing video games than ever before. Not only do they present imperishable spaces unaffected by the onset of time, but offer manageable pockets of escapism from a world in which we increasingly feel we have little control over. What if video games could be more than a cursory respite from the hazards and hard truths of reality, though? What if they could teach and empower the next generation about the defining question of our age? Sure, that might mean that our interactive entertainment will challenge us to grapple with a tough issue rather than escape from it, but if that’s part of the cost for a more sustainable future then we’d be stupid to complain. While the medium has been willing to dabble in the subject on a surface level here and there, we’re beginning to enter an era in which developers more systematically integrate the realities of global warming into the ebb and flow of their gameplay – perhaps as a subconscious reaction to its growing urgency in the public domain. Take the recently released expansion to Sid Meier’s Civilization 6, Gathering Storm, which throws a comprehensive climate change system into the series familiar recipe of strategy and politics. The game monitors the carbon output of each civilization, and correlates it with having a direct impact on the match board’s ecology. Get too greedy burning up as many fossil fuels as possible, for instance, and you and every other world leader in the game will have to contend with rising sea levels, temperatures, and natural disasters that can threaten to bring any competing civilization to ruin. Interestingly enough, Gathering Storm also introduces a World Congress mechanic into Civilization 6, in which leaders can hold regular summits to try and work together for the greater good (namely reducing humanity’s carbon footprint on the earth before mother nature decides it’s had enough). Of course, not every country will necessarily stick to their commitments, and there’s a sense of art imitating life as you and other players re-enact the ongoing fallout over the Paris Climate Agreement. The Civilization series has always been good at simulating the tug and pull of realpolitik, but Gathering Storm excels at demonstrating the immense, seemingly impossible challenge of solving climate change beyond the state level, which requires international cooperation on a scale never achieved before. In some cases, the situation can become so fraught that your only hope of survival is developing space technology to escape the game board altogether. As I watched my civilisation take to the stars to leave behind a planet I and countless others had destroyed through war, greed, and human obstinance, I couldn’t help but feel a lump in my throat, and think about whether Earth is indeed headed in the same direction. Civilization 6's new expansion is a hard to swallow portent for mankind’s future, then, but games don’t have to stop short at unfiltered alarmism when it comes to their eco-friendly subtext. 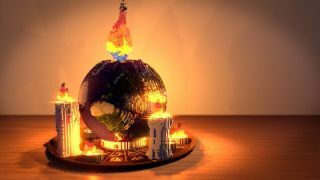 A recently released Minecraft mod called GlobalWarming, for instance, was created by a computing student last year, and attempts to teach the game’s vast audience of children and young people about the underlying logic problems involved in the collective fight against climate change. GlobalWarming introduces Carbon Dioxide into the atmosphere of Minecraft’s blocky landscape, and as players continue about their business of survival-crafting, their actions can have a positive or negative contribution to those precarious CO2 levels. Smelting metal, it will not surprise you, will emit carbon dioxide into the air, which in turn can lead to devastating spillover effects such as wildfires, storms, and the complete decimation of aquatic life. Players can try to avoid this Greenhouse Effect, however, by planting trees or even purchasing carbon offsets, which encourages other players to plant trees in their stead. GlobalWarming isn’t just another example of climate change scaremongering, though fear is undoubtedly a powerful and necessarily motivator for environmental action. It’s teaching Minecraft players how practical solutions amongst competing parties can be achieved for the sake of a common goal, by encouraging them to make small, early sacrifices at the behest of delayed gratification (that gratification being the survival of the biosphere itself). The accelerating heat death of the planet we live on is finally compelling our fiction to reckon with a reality that can no longer be ignored. No one’s saying the world leaders of the future are going to strike a successful green deal because they learnt their negotiation tactics from a Minecraft mod, but for one of the most popular games in the world to critically engage with the very human barriers to international action on climate change? It’s going to get pockets of the next generation thinking at the very least. If GlobalWarming is one Minecraft modder’s humble attempt to spread seeds of knowledge through play, Eco is its natural, grander evolution. A survival crafting game released last year, Eco is set in a procedurally generated universe with a thriving biodiversity of flora and fauna. You’re tasked with saving the planet from an imminent meteor strike by building up settlements and co-operating with the wider player community, but the entire ecosystem is just as vulnerable to human mismanagement as the giant rock hurtling towards it. Backed by player run governments and economies, Eco has been billed by developer Strange Loop as “Tragedy of the Commons, the game”, which is bitingly on the mark. Not only must players walk a fine balance between growth and sustainability, they’ll have to do so while engaging with the wider community by participating in elections, proposing new laws, setting tax rates, and developing specialisations in the local economy. If that sounds complex, it’s merely a simulacrum of the intricacies involved in building a sustainable world outside of the virtual one, and you can find dozens of Eco players on Reddit complaining about the challenges of corralling their in-game community around long term survival at the expense of immediate growth. In some cases, debates over taxation descend into polarised conflicts between political tribes, while in others, the selfish actions of a single freerider can debilitate the environment for everybody else around them. Like Minecraft’s GlobalWarming, but on a much grander and more detailed scale, Eco is a real time window into the circular dynamics of collective climate action against the clock. In 2016, Strange Loop won an $10,000 grant after winning the Games for Change Climate Challenge for creating an “effective tool for climate communication and education”, even as Eco was in the early stages of development, and its power as a case study for the future is only getting more potent. One of the major obstacles to political action on climate change is that, for the most part, it’s difficult to visualise a threat that’s years away from having a direct effect on the average Joe. Couple that with one of the inherent downsides of democracy, in which politicians are very much concerned with fixing immediate problems before the next election over any looming crises, and you can see why change at the top is slow. But video games can close the gap on that cognitive disconnect, throwing us into digital worlds and communities already under siege by global warming, and forcing us to deal with the impact, right there and then. Despite the power of that immersion, big budget titles are - for the most part - cautious to engage in that kind of salient subject matter, besides perhaps briefly referring to climate change as the reason for yet another video game apocalypse. But what if it wasn’t just the modders and indie developers who channel climate communication through play, but the Naughty Dogs and BioWares of the industry, who can speak to an audience in the millions? As Civilization 6, Minecraft, and Eco so aptly demonstrate, combating one of the biggest threats to our existence is very much an ‘all hands on deck’ deal, and that wide net of participation doesn’t exclude game developers. Thankfully, it seems as though the accelerating heat death of the planet we live on is finally compelling our fiction to reckon with a reality that can no longer be ignored. For more, find out the other ways in which video games are making the world a better place in 2019.